Students in 12 Egyptian governorates headed to school Saturday on the first day of the new academic year. Schools in other governorates will open their doors Sunday, bringing the total number of students back to classrooms to 18 million. There had been doubts that schools would start on time after universities postponed the start of their academic year to 11 October in anticipation of political upheaval on campuses. 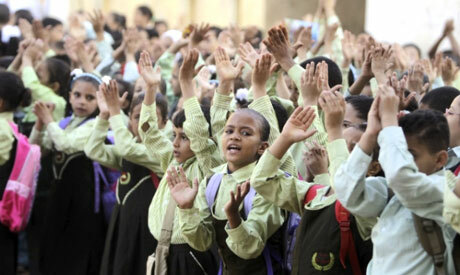 Education Minister Mahmoud Abo El-Nasr called for "keeping politics out of schools," state news agency MENA reported. The 2013 academic year witnessed a long series of politically-related incidents as the country became striken with divisions — mainly Islamists and non-Islamists — following the popular army-backed ouster of president Mohamed Morsi. Raising political signs, acute disagreements and some clashes were reported in schools. Meanwhile, Abo El-Nasr told MENA Saturday that he has cooperated with the interior ministry to ensure the safety of schools and students. The army has joined protection efforts, he said, near border areas that suffer from militancy, particularly in North Sinai. In addition, Cairo's security director said female police forces have been deployed near girls' secondary schools — where male students sometimes gather — to confront any sexual harassment. Sexual harassment has become prevalent in Egypt with the majority of women facing it on a daily basis. Abo El-Nasr also reiterated Saturday plans to renovate schools nationwide. Egypt has long suffered from a deteriorating education system, mostly blamed on insufficient government investment. Schools lack facilities and follow a poor curriculum while teachers complain of inadequate salaries. In August, Abo El-Nasr said his ministry has a long-term plan to improve education that would commence in its preliminary stage between 2014 and 2017 and would last until 2030. The plan includes the introduction of a nutrition programme in all public schools, eliminating illiteracy, and reducing the number of students dropping out.